When you own a boarding cattery it is essential that you are able to recognise when a cat needs to see a vet urgently and when you can make an appointment to visit the veterinary surgery. When you first open your boarding cattery it is a good idea to make yourself known to your local veterinary practise. On the whole vets do not make house calls unless it is an absolute emergency when you are unable to get the animal to the vet. When you book the cat into your cattery you will make a note of whatever vet the owners prefer to use. 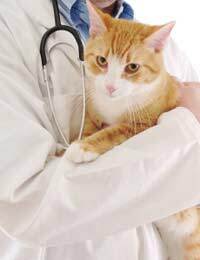 Whenever possible, if the cat is unwell whilst in your care you should try to use the same vet as the owners use. That way the illness is recorded on the cats file. There may come a time when you cannot get a cat to the vet because you are on your own and have no staff available to take over while you are absent. In this case you will need a vet to visit. The charge for a home visit can be as much as £100.00. If you are insured to cover vets fees you should make sure that the insurance covers vets home visits. You can insist on a visit from a vet if you really think it is necessary. Before you insist you could speak to the veterinary surgery and ask for vet advice. If you tell them the symptoms that the cat has, they will advise you as to how urgently the cat needs to see a vet. Veterinary surgeons are there to help and if they consider that you really need a visit they will make one. The problem will arise when they do not have the appropriate equipment or medicines to deal with the emergency, in that case they would probably take the animal to the surgery and deal with it there. If you really feel that you would like the reassurance of knowing that a vet will call at your cattery whenever you needed one, perhaps you could come to an arrangement with the nearest veterinary practise. You may be able to pay them a retainer which will guarantee a visit should it be needed. If you have a large cattery this could be an ideal arrangement but you would need to consider the cost against the possibility of needing this service. If you have staff that can be left in charge while you are away, it is probably easier to take the cat to the veterinary surgery. If more than one cat is ill at any one time with the same symptoms, it could be that whatever is ailing them is contagious. Once you have spoke to a vet you should really insist on a visit, as it would be very difficult for you to transport several animals at the same time, and if it was a contagious illness the least amount of movement outside the cattery the better.